Outdoor gardening is coming to an end, and our thoughts turn to house plants. I am blessed with rubber plants, heartleaf philodendron, Shefflera, and many others, that provide my “green” therapy during the winter months. 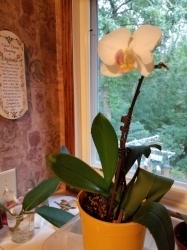 Two years ago, a friend of mine started me down a path that I had never traveled when she gave me an orchid plant for my birthday. Orchids had always intimidated me, so I avoided them. But my friend’s gift forced me out of my comfort zone. Not knowing anything about orchids, I needed help and I dove into print and online research. There is information on how to grow and care for a great variety of plants from African violets, cacti, growing citrus indoors, begonias and tropical ferns and palms and, of course, orchids. Need to know about pests and diseases, this is the place. All of the site’s information helps in identifying the appropriate steps to take to address the plant situation that may be in front of you. I learned about a plant disease called odemia and the effects that it has on plants. I believe that over the years my house plants have suffered from this and I never knew what to do. I also was reminded that most all house plants can absorb carbon dioxide and release oxygen which benefits our air quality. Now, let’s get back to the orchids. A link from the extension site took me to details on orchid care that addressed my issue. Based on the information, I was able to rule out any disease or insect problem which was a relief. My orchid had outgrown its pot, and had started to grow over the edge. It was time to repot. The information allowed me to identify the kind of orchard I had, a type that grows in the branches of tropical trees. Clinging to the trees provides support and moisture from the surface of the tree bark. These facts helped me decide to acquire the special orchard mix instead of using the regular potting soil I had around the house. I avoided a big mistake that could have been costly. I wish you the best with all of your growing efforts.